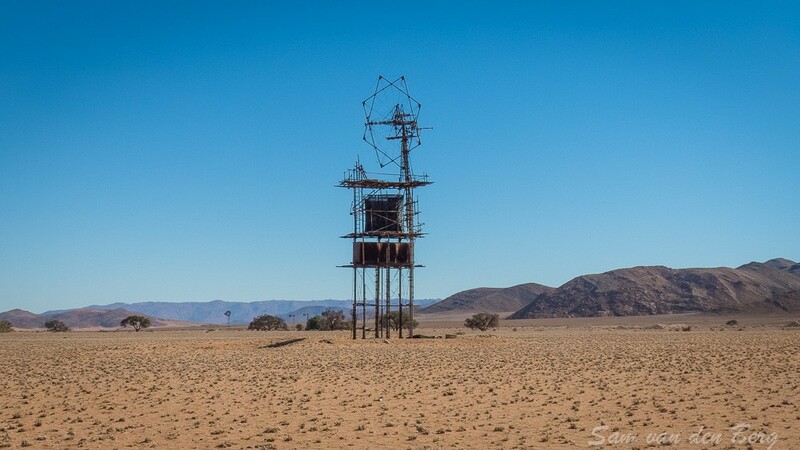 When travelling on the C13 in the south of Namibia between Aus and Helmeringhausen near the Tiras Mountains you will find this strange tower seemingly built from scrap iron. 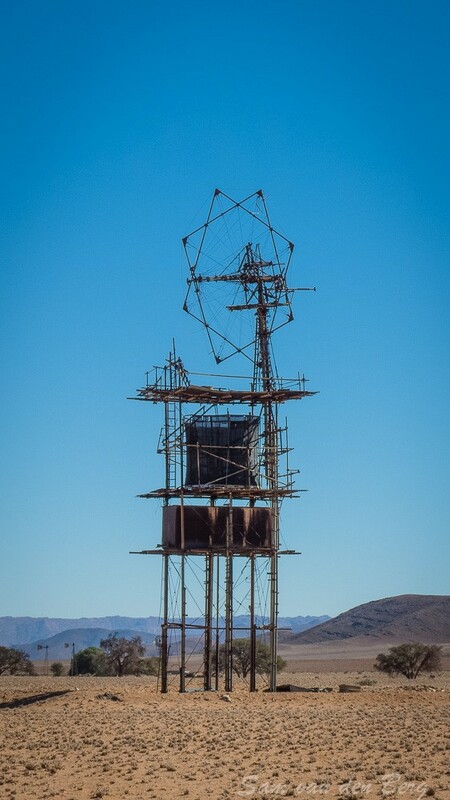 The tower is located on the farm Neiseb and was designed and built by Siegfried Schnebel. Before he became a farmer, he taught mathematics and Skeinat at the German school at Luderitz. According to him, there is a strong underground water source about 30 meters deep on the farm. The odd looking tower is in fact a huge windpump, intended to provide water to existing and “planned” fruit orchards and feed for livestock (Pricly Pear) fields. Traditional windpumps cannot provide enough water and larger commercial windpumps would not be able to handle the strong winds prevalent in the South. Accordingly Siegfried decided to design a wind driven pump that would meet his needs. To handle the winds, the windpump would use canvas rather than the solid metal blades of traditional windpumps. The metal blades would be too heavy for such a big wheel. In addition to the wheel there are also two water reservoirs built into the base of the tower. The foundation is 10 square meters and 2 meters deep consisting of rocks and iron. The tower would have a weight of 50 tons if the two water reservoirs were full. Unfortunately, the windpump was never used as Siegfried sold the farm.